"OH MY GOSH!!!!!!!!!!! AHHH!!!!!!! If I was someone who cursed, I would be in soooo much trouble right now, this book is so incredible. MUST READ." Since first reading this book back in 2013, I have always been in love with this entire series and every book in it with no exceptions. I have to say though, that this is the first time I've reread the entire first book, and I HIGHLY recommend rereading this series, because this second time around was so much better than the first. 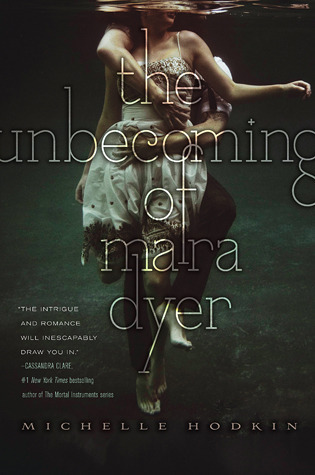 The Unbecoming of Mara Dyer is a beautifully creepy story that will wrap itself around your mind and take root there. There is simply no getting it off your mind, so if you get freaked out easily, be warned. But really, there are so many different well-constructed elements of this book that there is probably something for near every reader. The writing is magical, the plot is definitely intriguing, and the characters are perfectly flawed and real. What makes this all the more interesting, is that it is told in first person point of view from an unreliable narrator (Mara). There are some pretty strange happenings in this book, but the catch is that the reader can never really know what is real or not because while there are paranormal aspects in the book, Mara also has PTSD which makes her question everything. This is part of the reason why I would recommend reading it at least twice, because this second time through it read as all the more ingenious after knowing what happens in books 2 and 3, while also just being thoroughly enjoyable on its own again. One of the things that I love about this series is that it is framed by this cryptic opening letter that sets up not just this book, but the whole series, as a sort of confession. This letter, when I first read it, made everything all the more creepy. And then I found the backstory to the book, which made it all the more creepier, but also all the more amazing. The Unbecoming of Mara Dyer is one of my absolute favorite books that I have ever read and I cannot express fully the enjoyment that can be gotten from reading this book and this series. If you still have reservations about reading this book, I'll just finish with two words: Noah. Shaw.